Ask us about our Street Banner Options! 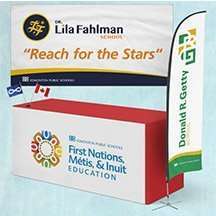 Your Source for Custom Flags, Banner Printing and Tradeshow Displays. Aurora Flags and Banners has long been Edmonton’s specialized source for custom flag and banner printing. With our acid dye digital printing and sublimation printing processes, Aurora Flags and Banners is able to offer trade show products like Step and Repeat back drops, custom fabric backdrops, fabric roll up banners, outdoor canopy tents and more. 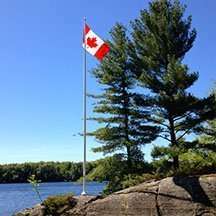 Aurora Flags also offers a wide array of hardware like commercial flags poles and now offers Installation services within the Greater Edmonton region. Not from Edmonton? No problem! We offer low shipping rates across Canada! Ordering Custom Printed Table cloths, Street banners or custom flags has never been easier! More Than Just Edmonton’s Custom Flag Shop! Aurora Flags & Banners (formally known as House of Flags and Banners) was founded in 1990 in Edmonton. Our shop has become the specialized source for fabric printing. Aurora Flags and Banners has evolved from a custom Flag Shop to a full-service custom fabric printer that specializes in large format and banner printing, Street pole banners, custom canopy tents, roll up banners, tradeshow displays, fabric table covers, sandwich boards, lawn signs and large billboards. Our team of professionals are experienced in helping you find the best solution for your display needs. Click below to download our lookbook. 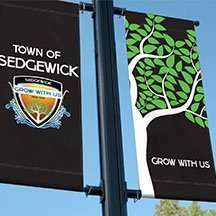 Lamp Post Banners are a mainstay for Cities, Towns and Events. Our Street Banners are made of heavy duty blockout mesh vinyl; nylon or sunbrella. UV inks and coated material allow for long lasting, durable street banners. Commercial aluminum flagpoles are great for new construction, cities, towns and public buildings. All our commercial poles come with internal halyards and all the hardware needed to install. We offer install services within the Edmonton Area. Commercial flagpoles are also available in fiberglass. Step and Repeat banners are perfect for galas, weddings, trade show events and grand openings. 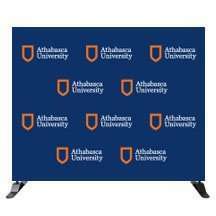 Our Fabric Step and Repeat back drop is easy to transport and set up. The fabric graphic is wrinkle resistant, fire retardant and provides a beautiful crisp print every time. Pick from our extensive line up of products and let us build you a custom trade show package. With products like convertible table covers, feather flags, canopy tents, roll up banners and backdrops- There is no better way to save money, time and ensure that all of your Trade Show products match, fit and work together the way you want them to. Why Choose Aurora Flags and Banners? We have been and always will be an Edmonton based company. There is no better way to know who you’re doing business with than to ask community members about them or see their products physically on display. Feel free to ask us for pictures of products currently on display or installed in Edmonton- chances are you’ll recognize them. Still not satisfied? We have references galore! Depending on the products you’re looking for we can provide multiple references for projects just like yours. Not in Edmonton? We offer competitive shipping across Canada and the USA on most of our products. Aurora Flags and Banners had built a reputation for being the go-to source for fast turnaround banners, signs and flags. Ask about our rush shipping and printing options! Not only will the product you have ordered be done on time and as per your expectations; the level of service that Aurora Flags and Banners extends to its’ client is unparalleled. Whether is taking the time to ensure that every last detail of your project is double checked, or sending a member of our staff to your site for an immediate delivery of a crucial project- we’re here for you. Whether you’re ordering a single flag or a large billboard- we stand by our work. We use the highest quality substrates, inks, and materials. Should there be any quality issue with the product you have ordered- we address the concern immediately and ensure that above all else, the customer is satisfied. With being in business for over 20 years, we have learned a lot about relationships. We value the relationship with our clients above everything else. Our goal is to establish a long term relationship with all our clients based on trust and mutual benefit. In our experience, there is nothing better than a trustworthy and reliable industry partner. Looking for a reprint from years ago? Lost your artwork files? Aurora has you covered. The Old Strathcona Business Association has a great working relationship with Aurora Flags and specifically Jabir Devjee. We’ve worked with Jabir both for banner creation and installation. Jabir’s professionalism, enthusiasm, knowledge and work ethic is evident in the service that he provides and we appreciate having him as an extension of the team as we work to beautify our community with banners and flags. We would happily recommend both Jabir and Aurora Flags. Aurora Flags & Banners were extremely efficient in meeting my tight deadlines. The level of professionalism of each team member I encountered was certainly outstanding and the prompt response time to my inquiries was always appreciated. Aurora was able to deliver on my unique project requests from conception to the final product. I am impressed with the quality of product and with Aurora’s ability to remain within the scope of my budget. I will certainly use them again for any upcoming projects.